Back in the 1980s and early 1990s, before I started actually reading Stephen King, I was under the impression that he was a pretty messed up guy. Wouldn’t he have to be to write the kinds of books he writes? In The Dark Half, King explores that very question and comes to some unsettling conclusions. This novel, published in 1989, is said to be King’s reaction to the outing of his alternate writing identity, Richard Bachman. The main character, Thad Beaumont, is the author of a couple of moderately successful literary fiction novels under his own name and several gruesome horror novels under the name George Stark. When Thad learns that he is about to be outed as Stark, he and his wife, Liz, decide to take control of the story themselves and put Stark to death while revealing that Thad and Stark are the same man. The trouble is, Stark turns out to be more real than they ever suspected, and he’s not ready to die. He was a writer, an imaginer. He had never met one—including himself—who had more than the vaguest idea of why he or she did anything. He sometimes believed that the compulsion to make fiction was no more than a bulwark against confusion, maybe even insanity. It was a desperate imposition of order by people able to find that precious stuff only in their minds … never in their hearts. Inside him a voice whispered for the first time: Who are you when you write, Thad? Who are you then? And for that voice he had no answer. Although I found the set-up and the ideas behind this novel to be compelling, I was not prepared for the extreme gore involved, particularly in some of the early murder scenes, as Thad’s alter ego takes revenge on those who have cooperated to bring about his demise. King does not generally hold back when it comes to violence in his novels, but he also does not generally feature the kinds of sick and ritualistic killings that appear here. Only Misery comes close to this, in my experience of King, and I thought the violence in Misery was less gratuitous than the violence here. In Misery, it built gradually and added to the claustrophobic terror. Here, it often involved characters we didn’t even have time to care about, and it felt over the top. That wasn’t enough to make me consider putting the book down, but I do mention it as fair warning to those who don’t handle violence and gore well. Setting aside the extreme violence, I liked the way the novel was set up, and King builds the tension well in the early chapters. Thad and Liz are a likable pair. Their companionable banter made me believe in them and root for them, and the gradual revelations about the struggles they’ve been through only made me want even more to see them stay happy. As the horrors began to unfold, I worried for them. I also really liked the sheriff Alan Pangborn. The early scenes between Thad and Alan are wonderfully tense. When I’m reading King, I’m almost always immersed and entertained, and that was certainly true for most of The Dark Half. This didn’t turn out to be a favorite King novel, and I wouldn’t recommend it for someone looking to give King a try for the first time. It’s nowhere near his most interesting or entertaining work. I’d start instead with The Dead Zone if you’re interested in more psychological novels or The Talisman (coauthored with Peter Straub) if you’re more into fantasy. I tend not to like books with sick ritualistic killings. 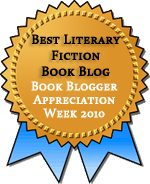 They are so often featured in mystery or horror books, that it makes me wonder how much they actually occur in real life. I hope it’s just a matter of authors going to greater and greater extremes to achieve an effect, and not that it is happening more and more! I suspect it’s just authors going for shock value. I can deal with it in small doses, but it’s not my favorite thing in crime and horror fiction. King usually manages to shock without that stuff, which made this a disappointment. I haven’t read anything by King since middle school. (Well, I take that back, I read his memoir/writing advice book last year). 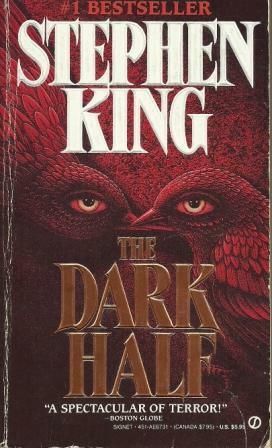 The Dark Half wasn’t one that I read, but i agree, I like how King haunts you with the story and the ideas. The Stand has still stayed with me years later, and I hope to re-read it soon. I think the only book that I didn’t enjoy so much was The Tommyknockers. I can’t remember much about it now except maybe aliens? The Stand is wonderful. Almost definitely in my Top 5 King novels (as long as The Dark Tower series is taken as one 7-volume book). I have not read The Tommyknockers, but I do think you’re right that it’s about aliens. I think it’s also one that Jenny (the real King expert on this blog) had said wasn’t much good. Jenny would actually be the best person I can think of to write the kind of post you describe. She got me into King despite my former tendency to pooh-pooh him as a hack. And she’s read all his books. King certainly isn’t kind to his writer characters. I think in the case of this book he’s exorcising some of his own demons. I don’t like to make autobiographical assumptions, but it is interesting to note that this was written at around the time he was dealing with his own addictions. I’ve just recently realised that I’ve never actually read a Stephen King! It’s probably because I’m such a complete chicken when it comes to horror. I used to be a chicken, too, but I’ve mostly gotten over it in recent years. And not all King’s books are scary. Of course, it all depends on what you find scary, but I don’t think all of his books could be described as horror. [SPOILERS] I was really hoping he would push the identity thing further and have Thad and Stark become a singular identity toward the end. There were a few flags that seemed to indicate that Thad was actually denying who he was and that this was at the root of his addictions, writer’s block, etc. I thought it would be interesting to have him accept his “shadow self” (i.e., Stark) as part of who he is, which would put him on the road to becoming a whole person and also prevent Stark from committing actual evil acts. There were a couple of moments toward the end that seemed to scream for this solution, and I thought King wimped out by having Stark destroyed. [CONTINUED SPOILERS] He does this in “Secret Window, Secret Garden,” which is pretty much the exact same premise. I think King’s novellas are often more frightening and sometimes more successful than his longer novels (though he’s written so many, that’s a huge generalization.) It’s why I’m looking forward so much to Full Dark, No Stars. I probably exaggerated how much I loved Bag of Bones. I really did like it up until the very end. The villains were awesome and the premise was excellent, and I thought the grieving writer struggling with ghosts was very creepy. The ending kind of put me off, though. I’ve actually forgotten a lot of Bag of Bones. It’s one I enjoyed while I was reading it and then promptly forgot. I’m reading and rereading King over the next couple of years. This is actually one of his that I haven’t read before now but I’m a little put off by the violence. Lucky for me it will be awhile before I get to this one in the chronological order! The over-the-top violence is mostly confined to the first half of the book at least, but ugh… it’s pretty awful. More than most of the King I’ve read.